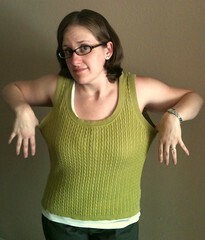 First, I chopped off the top from underarm to underarm. 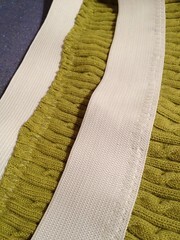 Next, I cut my elastic to the right length (just wrap it around your waist and tighten until it feels like a bit snug) and used a zig-zag stitch to join the ends. 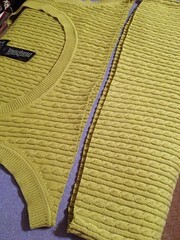 Then I pinned my elastic to my sweater tube, which can be a little tricky since each will want to stretch in their own way. I find it easiest to pin at each side, then find the midpoint of the elastic between each pin and the midpoint of the skirt between each pin, and pin those spots together. 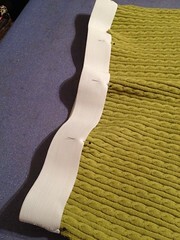 Then keep pinning midpoints until you have enough to hold it in place while you sew. 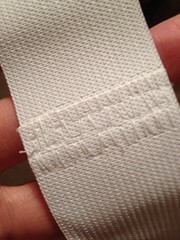 Finally, I used a zig-zag stitch again to attach my waistband to my new skirt. You'll want to pull gently while you sew so that the elastic and knit fabric are the same length between pins as it goes under the presser foot. But be careful not to stretch too much. 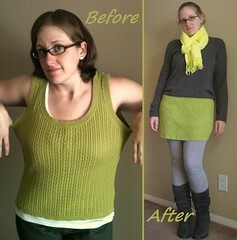 ...or pair it with some tights and boots, and you're all set for autumn! 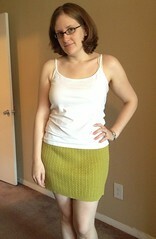 Join me next time for a variation of this refashion that will maintain a little more length for your new skirt. So cute...love the color too!